Data centers have become the new warehouse of the 21st century. Literally millions of bits of information flows through their servers daily, and corporations and organizations rely on them for optimal performance. A corporation’s data is among some of its most valuable capital, and should be thusly protected. When considering data protection, the old adage that “it’s better to be safe than sorry” certainly applies. Any data loss or network interruption can be catastrophic to an organization. Yet many often think that once they have their data flowing through a server farm, concerns about its safety are unwarranted. That attitude can be dangerous, as there are still a number of ways outside of conventional methods through which data can be lost. Often a single layer of protection isn’t sufficient, and there are some things that even a firewall can’t stop. Thus, it’s encouraged to consider any and all aspects of your data’s safety, even when it’s under the care of a data center. This is certainly one area of business where overkill is underrated. A Threat from the Center Itself? When considering the security of their data, most focus on protecting it from intrusion. And with good reason; cyber crime and the theft of intellectual property can be disastrous. Yet many overlook concerns about the where their data is being stored, and the potential risk that the actual data center can pose. Try leaving a refrigerator door open for than 5 minutes and see what happens. Most are surprised to find out that the room actually gets warmer. That’s due to the increased energy consumption that the refrigerator has to use to power the motor to keep its contents cool with the introduction of the outside air. That energy is given off of the unit as heat, and its effects are noticeable. The same principle of thermodynamics applies to a data center. Servers that are in constant use expend a lot of energy. This energy causes the actual machine housing to heat up. Now, imagine many of those servers stacked one atop the other from floor to ceiling, all arranged in row after narrow row, filling the room. Couple that with the miles of wiring comprised mostly of copper and other alloys that are terrific conductors of heat that connect the machines, and one can imagine the immense heat that builds up inside of the rooms of a date center. The introduction of any small amount of combustible material to such a hot environment could easily produce a literal fireball. Most data centers have measures in place in to combat these potential hazards. The rooms housing the servers must be well-ventilated to help transfer some of the heat outside of the room. Yet, in the event of a fire, these ventilation systems can also serve to delay response. The rapid airflow caused by a ventilation system can actually carry smoke away from the source before a smoke detector can trigger any sort of fire suppression system. Aside from fire, water is the next most harmful substance to a server. Yet most data centers employ some form of sprinkler system as part of their fire suppression system. Water raining down upon the servers in the event of a fire can often cause more damage to a server farm than the fire itself. Often, the suppression systems themselves are the actual hazard. 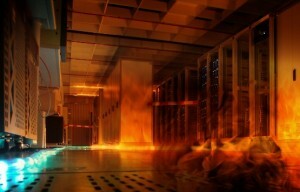 Accidents have happened at data centers where fire alarms either triggered incorrectly or by an inconsequential amount of smoke have accidently damaged or destroyed all of a center’s assets when their servers were doused by the sprinkler systems, causing data loss and greatly limiting the operational effectiveness of entire companies and organizations. Corporations are faced with a bit of a dilemma: finding data centers to house their information and run their servers that don’t in-and-of-themselves pose a threat. The answer only comes by placing an extensive amount of time into researching how a data center handles the risks of fire, and what methods it employs in extinguishing one should it occur. Because the mission-critical nature of data centers require that extended downtime be avoided at all costs, simply turning servers off to allow them to cool isn’t a practical way to mitigate the risk of fire. Given that a center can’t totally eliminate the risk, the key to better protecting a center and it’s servers from fire then is to find way to immediately identify fire at its source and to suppress it without damaging the servers in the area. Recent advances in fire suppression systems have turned such ideas into possibilities. In order to better identify the source of fires, photoelectric smoke detectors have been created that to better detect combustion particles in the air. The detectors can be placed on ceilings or within air ducts. These new systems also help in preventing false alarms from causing any potential sprinkler damage, as they use microprocessing devices that function in real-time to determine if whatever the alarm is sensing is real or not. New suppression solutions have also been created to replace conventional sprinkler systems. Rather than using water, these systems instead deploy gas-based, waterless agents aimed at extinguishing the fire in its inchoate stage. These agents work by either absorbing the heat from the source of the fire or by depleting the oxygen in the area and essentially choking the fire out. Once settled, no residue is left on the machines and their performance is unhindered. Data centers have helped countless organizations to increase their operational effectiveness and protect their data. Yet there are safety trade-offs to be made when considering renting space within a center. However, a little research into the safety practices of a data center can help one know with which providers he/she will be able to enjoy the effectiveness that they offer without the safety risks.